Posted: Monday, September 26, 2016. 3:07 pm CST. By BBN Staff: With all the unrest in Belize and slow shift in political momentum, the teachers have stepped in at a critical time in the nation’s development. The Belize National Teachers Union (BNTU), no doubt the country’s most powerful union, has given Prime Minister Dean Barrow a list of demands and are threatening strike action if he does not comply. There’s no school when the teachers strike. This is quite obviously a problem for everyone for a number of reasons, which the government recognizes. It is the reason why Prime Minister Barrow is definitely feeling the pressure and has called the BNTU’s approach unreasonable. But how unreasonable is the teachers’ approach and how unfair are their demands? There are some who believe that the teachers are mostly clamoring for their 3 percent salary adjustment, which government has said it does not have the money to pay. And while that may absolutely be the case, it is refreshing to see the union taking a stand against many of the other ills plaguing the country because of blatant corruption in government. In the Prime Minister’s statement yesterday he said the teachers never mentioned the 3 percent salary increase in his meeting with them last week. He alluded that the union is being politically manipulated. He has called the union unfair and his ministers have embarked on a “Know the Facts” social media campaign. Well, the fact of the matter is that this government reeks of corruption and a change is in order. But that change does not mean a change in government. It has to be meaningful change. There are several key points that need to be taken into consideration on the BTNU’s list of demands, and this is why the teachers need all the support it can muster. If Belizeans rally around this cause, and put enough pressure on this government, changes can be made to safeguard the people’s money, the country’s development and the livelihoods of generations to come. The teachers’ fourth demand to the Prime Minister include the appointment of the 13th senator, the appointment of the Integrity Commission, the recomposition of the Public Accounts Committee (PAC) and the signing of the United Nations Convention Against Corruption (UNCAC). Among other demands, the teachers have also demanded an independent investigation into the murder of Pastor Llewelyn Lucas and a Senate Inquiry into the Auditor General’s special report on Immigration. The demands which focus on oversight, however, should rally immediate support from all sectors of the Belizean society. If those systems can be corrected now and they are properly enforced, Belize can finally be put on a path of true national development. The problem is that government as it currently exists, enjoys way too much power. Conflicts of interest aren’t much of a conflict for the leaders of our nation. Politicians face very little consequences for their actions, and that, more than anything else needs to change. The people put in power need to be reminded that true power rests with the people who put them there. The Prime Minister loves to note that standing orders of the House state that the balance of power in parliament needs to be reflected in House Committees. But that is a failed system, he knows it and he loves it. And so did the former Prime Minister and the one before him and the one before him. They all know that the system does not work. How can you put the rat to guard the cheese? What thief will arrest himself? What absolute non-sense is that? It begs the question, what the hell were our forefathers doing when they fought for Independence if they could not address such a basic issue at the very birth of our democracy? But now, Belize has a very rare opportunity to finally make things right. Corruption and scandals have tarnished this UDP government’s image. Now in it’s historic third term, yet interestingly only in its eighth year in office, this administration seems to be at its most vulnerable since first taking office in 2008. The teachers have the government in a bit of a pickle, because again, no school means big problems. But there comes a time in every nation’s history when it must band together, when enough is enough. And that time should be now for Belize. Ensuring that there is proper oversight of public funds and enforcing corruption laws that would land corrupt ministers in jail is what the country needs. Penalties for corruption charges should be stiffer than charges for minuscule amounts of marijuana and misdemeanor crimes. Let there be a 13th Senator to ensure that the senate isn’t just another one of government’s rubber stamps; take away the majority from the government in all oversight bodies including the PAC and the Integrity Commission. And if amendments need to be made to the Standing Orders of the House and the Prevention of Corruption Act, then table the amendments. Introduce whatever legislation the UNCAC requires be introduced. It is time to clean up this country, starting from the very top. 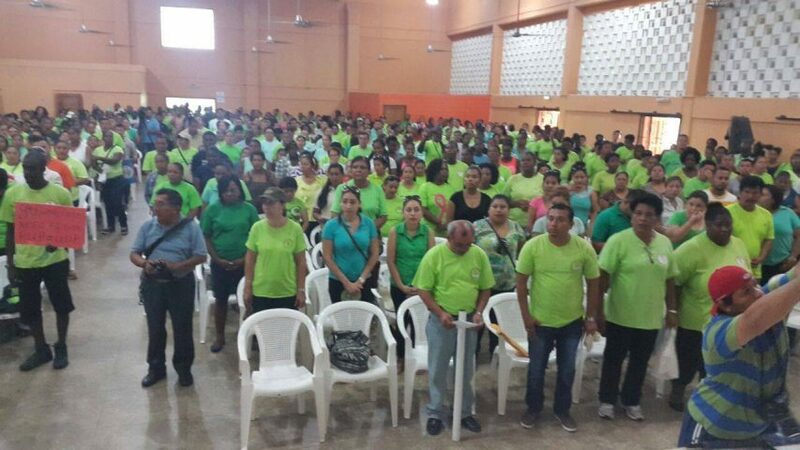 The teachers need to hold strong, not for their 3 percent, but for Belize’s future. Teachers must lead by example. Sometimes the lesson a teacher teaches outside the classroom is even more important than the lesson inside. The lesson this time must be to stand for what is right, even if it makes you unpopular, even if it requires great sacrifice. There is great strength in numbers, and the teachers have reminded us all. That is why, now more than ever, Belizeans from every sector must seize this opportunity to make a difference for a better Belize in generations to come. Stand behind the teachers and rally around this cause. The teachers’ 3 percent adjustment should be at the very bottom of the list until all other issues are resolved. Somethings are worth more than money.